On Sept. 27, Dr. Blasey Ford spent one of the toughest days of her life being quizzed in front of the Senate Judiciary Committee as the nation watched. 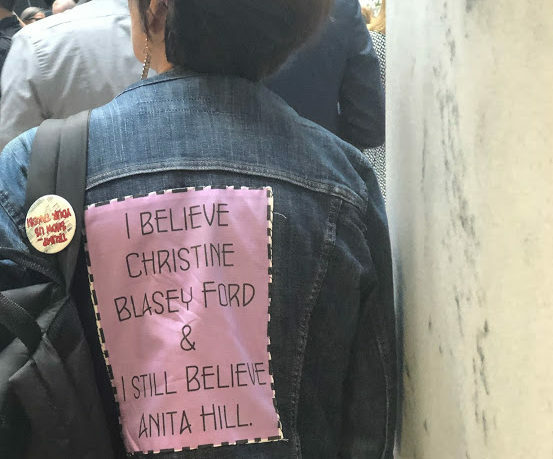 She embraced it with great courage and dignity. The Democratic senators — as did I — found her testimony to be sincere, honest, inspiring and believable. The details of the assault were chilling and it is clear Professor Ford has suffered great trauma. The details had the ring of truth in spite of a memory that lacked some critical particulars, which are explained by the trauma associated with post-traumatic stress disorder. These could have been aided by facts drawn out by an FBI investigation. The Republican majority and the president did not deem this necessary even with the addition of two more accusers coming forward with allegations against Judge Brett Kavanaugh. When Kavanaugh was in the hot seat, his disposition was far more edgy. He spent the first few moments opening his water bottle, moving it, adjusting his name plate, rearranging his seat and mike and twitching, nervously. His constant reach for water reminded me of Sen. Marco Rubio during his Republican response to President Barack Obama’s State of the Union address. The episode was so memorable that it became a meme and Donald Trump regularly used the incident as comedic foil. In the fight for his life, Kavanaugh was on the offensive and appeared to be clearly fighting back tears. I wanted to believe that Kavanaugh could convince me he wasn’t connected to the incident. I was unable to do so. As many people have contacted me to extol the virtues of Kavanaugh and his wife, I wanted to give him the benefit of the doubt, presumption of innocence and respect for the process. Notwithstanding, Sen. Lindsey Graham’s heated self-serving defense (or was it an attack? as he prepares himself to fill Jeff Sessions shoes), the only solid conclusion I arrived at is that Kavanaugh is doomed, if not tomorrow then down the road. We are left startled and amazed by his conduct, while acknowledging that he is under extraordinary pressure. I cannot help but feel empathy for what he and his family has had to endure. A rattle of chaos was woven into the words of Kavanaugh’s testimony, for he may know that he has a tenuous path to confirmation but his problems are far from over. His credibility as a Justice will constantly be in question and if the Democrats win a majority in the House, they will come knocking again. Though Trump naturally empathizes with the plight of a man accused by women of sexual misconduct, he does not like it when people appear weak or need water mid speech — a further sign of weakness to his mind. Remember who coined the nickname for Rubio as the “choke artist”? Narratives aside, the sniffling and broken tempo of Kavanaugh’s rages and shouting stood in stark contrast to the elegant composure of his accuser or his beautiful dignified wife. I left the hearing with an image of her sweet, long suffering face, which I will never forget. Over explaining, sniffling and tales of heavy drinking are not behaviors becoming of a Trump-brand ambassador or a future Supreme Court justice. Trump may be whistling Dixie tonight at Kavanaugh’s performance in the Senate, but give him a few days. I expect Kavanaugh to have a heated post-mortem with The Donald, where only Diet Coke is served. Behind the scenes, Trump and Don McGahn will need a War Room plan to deal with the potential civil and criminal cases that could be pursued by the State of Maryland. A Senate Judiciary vote is scheduled for tomorrow at 9:30 a.m. EST, but will be postponed if they don’t have the votes to push Kavanaugh’s nomination through to the floor for a full vote on Tuesday or Wednesday.